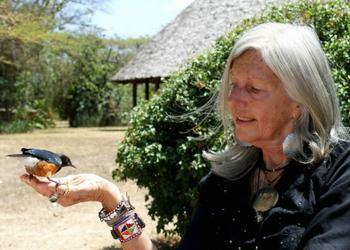 NAIROBI, Kenya, April 24, 2017 (ENS) – Conservationist and author Kuki Gallmann, 73, was shot and wounded on Sunday morning in Kenya as she was inspecting damage committed by arsonists to her property, an expansive conservation park in Western Laikipia, in Kenya’s Great Rift Valley. Invaders burned down a retreat on Gallmann’s Laikipia Nature Conservancy Saturday. A luxury safari lodge on the property was burned down in March by suspected cattle herders, who have been in conflict with area landowners. Gallmann was followed in a separate vehicle by a platoon of Kenya Wildlife Service Rangers who are based at her Laikipia Nature Conservancy to provide wildlife surveillance and security. After inspecting the damaged property, Gallmann was returning to her home when she was ambushed at a tree laid across the road. She was fired upon by the suspected Pokot herdsmen and sustained bullet wounds to the abdomen. The Kenya Wildlife Service Rangers returned fire and were able to rescue her. They brought her home, where first aid was administered. She was airlifted to Nanyuki for additional treatment and then to the Aga Khan Hospital in Nairobi for surgery, according to a statement by Kitili Mbathi, director general of the Kenya Wildlife Service. “Gallman is an Honorary Kenya Wildlife Service Warden of long standing and her Conservancy hosts significant wildlife, making it an important wildlife conservation area,” Mbathi said. “We would like to commend the courageous and swift action by the KWS Rangers, which was able to save an ardent conservationist,” he said. Mbathi condemned “the unprovoked attack by the suspected herders” which he said poses a security threat to residents and wildlife in Laikipia. A surge of violence has disrupted Kenya’s drought-ridden Laikipia region as armed herders searching for grazing land have driven tens of thousands of head of cattle onto private properties from dry communal land. The Gallmann family owns the 400 square km Laikipia Nature Conservancy and employs 250 Kenyans at lodges and other businesses on the land. Decades of protection has turned theproperty into a biodiversity oasis that supports and protects the only pristine forest in the area. The conservation park shelters endangered species such as elephants and cheetah, over 470 species of birds, and rare and endemic plants and insects, in addition to archaeological sites. But the property is often attacked. In January 2016, authorities netted about 14 tonnes of rare and imperiled sandalwood with an estimated street value of Sh 30 million cut secretly at night from the Laikipia Nature Conservancy. Born in Treviso, Italy, the daughter of Italian climber and writer Cino Boccazzi, in 1972 Gallmann moved to Kenya with her husband Paolo and son Emanuele. They acquired Ol ari Nyiro, the 98,000 acre cattle ranch in Western Laikipia, which she would transform into a conservation park. Both her husband and son died in accidents within a few years of moving to Kenya. Gallmann decided to stay in Kenya and to work toward ecological conservation, becoming a Kenyan citizen. As a living memorial to Paolo and Emanuele, she established the Gallmann Memorial Foundation, which promotes the coexistence of people and nature in Africa and is active in education, biodiversity research, habitat protection, reforestation, community service, peace and reconciliation, poverty alleviation and public health. Gallmann has published five books, all global best-sellers. The first, her autobiography “I Dreamed Of Africa,” became a feature film starring Kim Basinger. In 2008, after Kenya’s post-election violence, she founded the Laikipia Highlands Games (Sport for Peace) to bring together youth of previously warring tribes across ethnic, tribal and political divides through peaceful but challenging sports competition. The Laikipia Highlands Games won for Kenya the 2009 Event of Year World Award by the Peace and Sport Foundation in Monaco. In 2010 Gallmann founded Prayers for the Earth, to involve local tribal elders and youth to recapture the traditional respect for the environment on which their livelihood depends, and reconnect to the Earth through traditional worship. In 2011, with her daughter Sveva, Gallmann acquired and donated 300 acres for a model community project called “Land of Hope” in Laikipia West, which aims to benefit impoverished communities of the area. It now hosts a vocational centre for women and youth, a nursery school and feeding program, a dispensary, and a high altitude athletics training center. Among her honors, Gallmann was named World Ambassador for the Migratory Species by the United Nation Convention for Migratory Species in 2006. In 2012, Italy bestowed upon Gallmann the Grosso d’Oro Veneziano International Award for Lifetime Conservation Achievement.